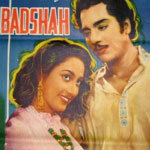 "Badshah" is a 1954 hindi film which has Pradeep Kumar, Usha Kiran, Mala Sinha, Ulhas, K N Singh, Agha, Achla Sachdev and Hari Shivdasani in lead roles. We have one song lyrics and one video song of Badshah. Shankar and Jaikishan have composed its music. Lata Mangeshkar and Hemant Kumar have sung these songs while Hasrat Jaipuri has penned its lyrics.